Texas Pizza Delivery Insurance. One of the top goals of most pizza delivery businesses is to deliver pizza to customers while it is hot and delicious, and it is this goal that often makes pizza delivery businesses among the riskiest in the restaurant industry. Delivery drivers try to rush to their destinations to earn the biggest tips, and many do so while violating the rules of the road, leaving your business delivery business at risk of liability. Texas pizza delivery insurance can provide a buffer of protection for your business should a well-meaning driver cause a claim to be filed against you when he is involved in an accident that causes injury or property damage. 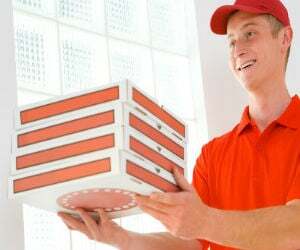 Texas pizza delivery insurance protects your business from lawsuits with rates as low as $47/mo. Get a fast quote and your certificate of insurance now. A Texas pizza delivery insurance policy that meshes with your risk level and needs is an important business purchase for pizza delivery businesses. This is true whether you own a large TX pizza restaurant that hires drivers or work as a self-employed owner of a small mom-and-pop shop. Commercial car insurance. Protect your TX business from risk with a commercial car insurance policy. This should be an all-inclusive policy that protects the business from risks when drivers drive owned and company-owned vehicles for business purposes. Worker's compensation insurance. Worker's comp provides delivery drivers coverage for lost wages and medical bills resulting from covered events while on the job. 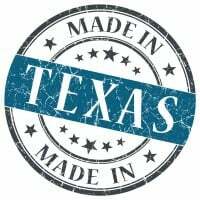 TX requires any employees that are not owners have this coverage. Business owners can choose from two separate types of TX auto insurance for their pizza delivery businesses, including employee-owned car coverage and company-owned coverage. All drivers working for the business must be listed on the company's policy. The insurance company needs to know how many vehicles the company uses and how many employees use the vehicles. Non-owned auto coverage shields the business from liability when a driver uses his personal vehicle to deliver products to customers. Most personal policies for drivers do not cover accidents resulting from using a personal car for business needs. A business owner or BOP policy is an important type of Texas pizza delivery insurance coverage for businesses, including pizza delivery businesses. It provides both independent restaurateurs and franchise owners with coverage against common perils as well as the interruption of business and related costs should the business be forced to close down temporarily because of a covered peril. Much like ordering pizza with the topping you want, a business insurance package lets you base your coverage on the needs you have, and then expand on those needs and Texas pizza delivery insurance coverage types if your business model changes. A general policy that covers liability from claims and costs associated with property damage is a standard policy. Request a free Texas Pizza Delivery insurance quote in Abilene, Allen, Alvin, Amarillo, Arlington, Austin, Balch Springs, Baytown, Beaumont, Bedford, Benbrook, Big Spring, Brownsville, Bryan, Burleson, Carrollton, Cedar Hill, Cedar Park, Cleburne, College Station, Colleyville, Conroe, Coppell, Copperas Cove, Corpus Christi, Corsicana, Dallas, DeSoto, Deer Park, Del Rio, Denison, Denton, Duncanville, Eagle Pass, Edinburg, El Paso, Euless, Farmers Branch, Flower Mound town, Fort Worth, Friendswood, Frisco, Galveston, Garland, Georgetown, Grand Prairie, Grapevine, Greenville, Haltom City, Harker Heights, Harlingen, Houston, Huntsville, Hurst, Irving, Keller, Kerrville, Killeen, Kingsville, Kyle, La Porte, Lake Jackson, Lancaster, Laredo, League City, Leander, Lewisville, Little Elm, Longview, Lubbock, Lufkin, Mansfield, Marshall, McAllen, McKinney, Mesquite, Midland, Mission, Missouri City, Nacogdoches, New Braunfels, North Richland Hills, Odessa, Paris, Pasadena, Pearland, Pflugerville, Pharr, Plainview, Plano, Port Arthur, Richardson, Rockwall, Rosenberg, Round Rock, Rowlett, Sachse, San Angelo, San Antonio, San Benito, San Juan, San Marcos, Schertz, Seguin, Sherman, Socorro, Southlake, Sugar Land, Temple, Texarkana, Texas City, The Colony, Tyler, University Park, Victoria, Waco, Watauga, Waxahachie, Weatherford, Weslaco, Wichita Falls, Wylie and all other cities in TX - The Lone Star State.